As an aside, before continuing on with reporting on this adventure, I think it’s worth noting that this remarkable barrier reef, heaved up from the ocean floor to become the Napier Range, is not the only stunningly ancient bit of rock in this corner of Australia. It’s all mind-bogglingly old here. 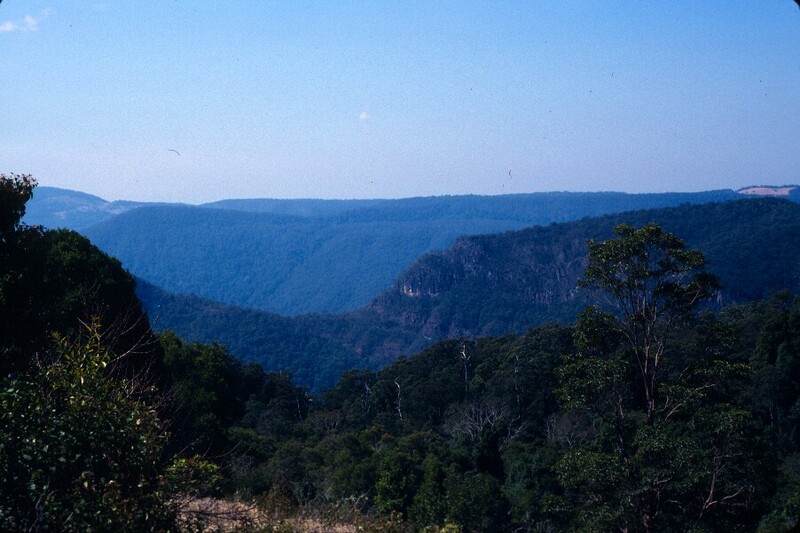 In fact, the Hamersley Range, a bit south and west of here, and which I visited on my first trip Down Under, is believed to be the first part of the Earth’s crust to have cooled after the planet was formed. Here’s one of the posts I did a few years ago about my time in the Hamersley Range, after a visit to Hamersley Gorge, one of many breaks in the range, but one that is famous for showing clearly the effects of the tremendous pressure that formed and shaped some of these ancient rocks. Then, just a few years ago, on a sheep ranch at Jack Hills, not too far from the Hamersley Range, scientists found what they believe to be the oldest chunk of rock on the planet—a zircon crystal that they estimate was formed at the planet’s dawning. Here’s an article with more details on this ancient zircon—and a photo. So I was traveling through a region where phenomenal antiquity is the norm. One more reason to love this remarkable place. Well, wounded or not, I was ready at 5:30 for our sunset cruise. Glad I went, as it was brilliant. 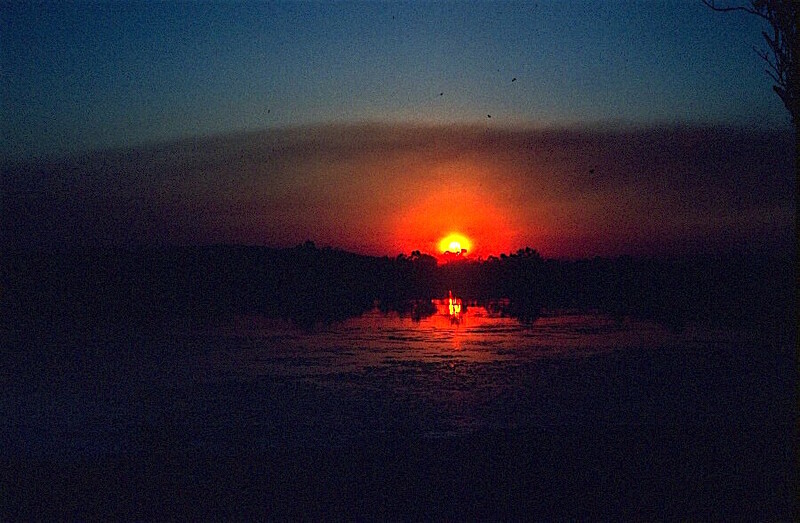 The huge, orange, fireball sun was setting behind the fringe of trees along the edge of Lake Kununurra when we arrived. 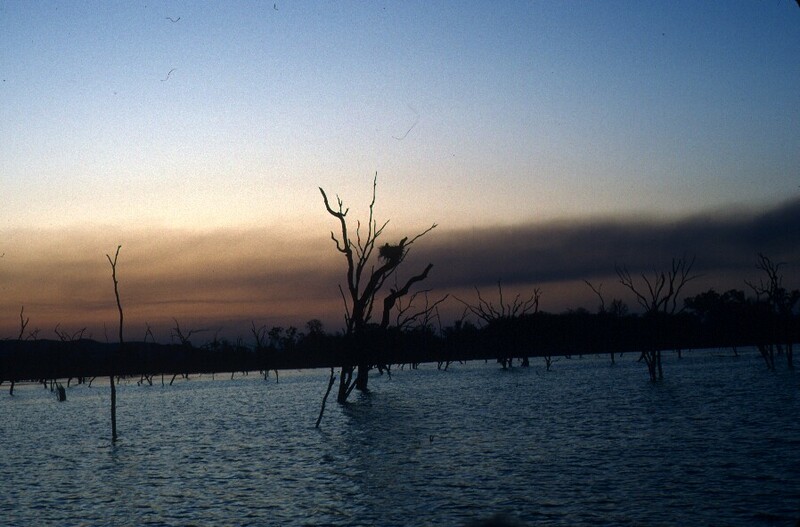 The lake’s surface was patched with lily pads, and stark, dead trees stood in the water near shore, where the lake’s expanded border had drowned them. Flying foxes hung from trees near the water. Our boat cut silently through the water as we glided out onto the lake. We were surrounded by birds—darters, egrets, pelicans, grebes, green-winged pygmy geese, and jicanas. The jicanas were particularly delightful, as there were so many of them, and because they were nesting, so they let us get much closer than would have been possible if they didn’t have nests to watch over. Wonderful. Once the sun had set, the guide (a local guide, not John) turned on spotlights that were mounted on the side of the boat. The lights showed us crocodiles along the shore and among the lily pads, and even swimming under water, near the boat. We could see fish and underwater plants, too. It was fabulous. The guide shared some interesting information about the crocodiles all around us. These crocs were the freshwater variety, so smaller than the massive saltwater crocodiles, and not as aggressive. Freshwater crocodiles (or freshies for short) need a warm day to digest a meal. If they eat, and then there’s a cold snap, they can die, as the undigested food will rot. All crocodiles are capable of remarkable bursts of speed, but they do it anaerobically—that is, they stop breathing and stop pumping blood. That’s why they can only run for very short bursts. If they have to run for too long, the buildup of lactic acid can kill them. Our guide then said that, while they eat fish, these crocodiles can actually do pretty well eating insects. He then tilted the spotlights upward, to demonstrate the remarkable density of insects over the water—and it was unbelievable. The air above the water was a veritable soup, but a swirling, fluttering soup. Looking straight up was worthwhile, too, especially once the spotlights were turned back downward. With no branches or cliffs overhead, our view of the nighttime sky was completely unobstructed, and the stars were dazzling. After our cruise, we headed back to camp, where Kate had a lovely dinner of grilled fish waiting for us. For dessert, we were offered wonderful melons, and it was explained that Kununurra is the melon capital of Australia. Yum. More lovely conversation, and then to bed, as we have an even earlier than usual start in the morning. A very interesting fact about koalas just popped up in a video from SciShow — a series that offers scientific explanations for various phenomena. Someone had asked why koalas hugged trees, and researchers have now found out why. Fun stuff. It was a wonderfully nature- and wildlife-oriented day. 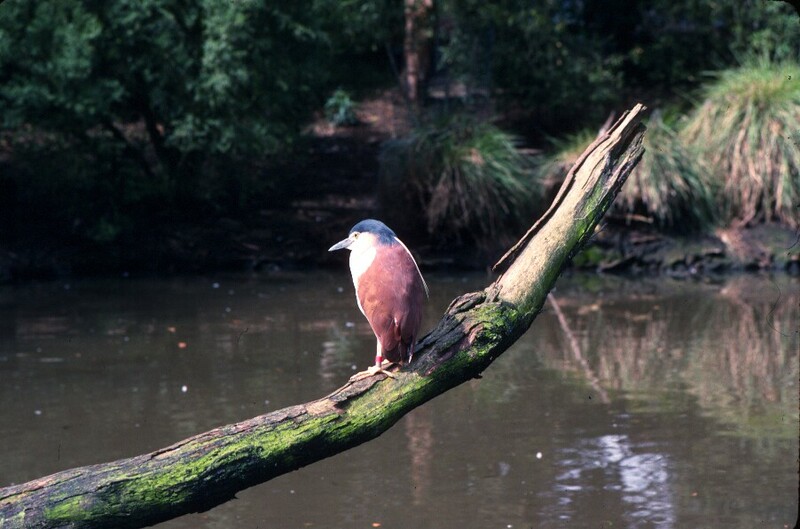 I was up by 6:30 and headed off with Judy to do a few errands, but then we headed off toward Healesville Sanctuary. As we drove among the trees along the winding mountain roads, we were surrounded by the music of bellbirds and magpies–music that continued even once we reached the sanctuary, though blended with many other sounds. We spent almost the whole day wandering amid the wonderful birds and animals at the lovely, forested sanctuary. Healesville is well known for its research into that most remarkable of animals, the duck-billed platypus, and I can now attest to the fact that the creature seems just as improbably in real life as it does when being described. Leathery bill (with electrical receptors, like the skin of a shark), soft fur, webbed claws, the males with a poisonous spur. Even without seeing them lay eggs, it was clear that these little mammals would be hard for early scientists to figure out when they were first discovered. 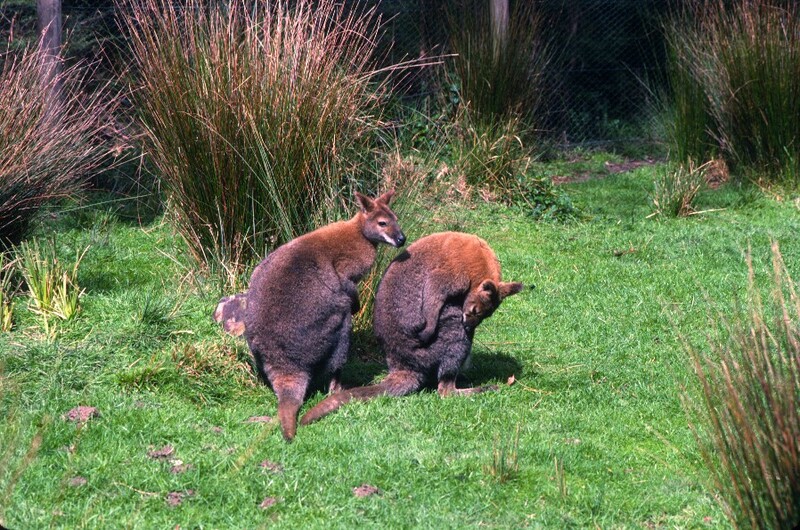 Echidnas, the only other egg-laying mammals (monotremes) were on hand as well, as were wallabies, lizards, possums, pademelons, koalas, dingoes, and a remarkable range of birds, from the towering emu to the tiny honeyeater, and of course many parrots. After several hours and at least a hundred photos, it was time to head home for dinner. As Judy prepared the meal, any fat scraps trimmed from the meat were set aside. While things simmered and roasted, Judy, fat scraps in hand, led me outside to a spot where kookaburras and butcherbirds had begun gathering already, having seen Judy approaching. 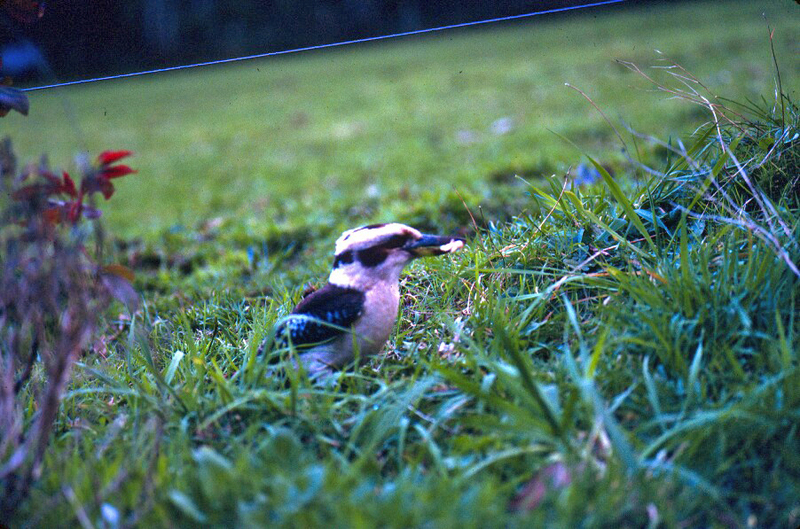 The kookaburras picked up their treats from the ground and carried them to a branch, but the butcherbirds only catch food on the fly, so Judy was tossing their scraps high overhead, and the butcherbirds were snatching them in mid-air. What a show. Another lovely dinner and companionable evening with charming, interesting people who love so many of the things I do. Another glorious sunrise, accompanied by the symphony of birds. My back, shoulders, and neck still ached from carrying a pack and camera equipment yesterday, but a few minutes of vigorous exercise loosened the muscles back up. Again, at breakfast, the birds came to check for handouts. Most abundant were the rainbow lorikeets, followed by currawongs, plus a few crimson rosellas, and a satin bowerbird dashing in out of the brush, hoping the other birds would drop something. James, the lodge manager (a handsome, young man with immense enthusiasm for the beauty of this place) came around to see who would be coming on the Tullawalal Circuit hike with him this morning. This is one of the “short walks” at Binna Burra, and I signed on. Then I dashed back to my cabin to finish packing and moved my gear to the lodge, since checkout was at 10 am, and I’d be on the hike then. As we had done yesterday, we gathered at 9 am on the flower-bordered lawn behind the dining room (always behind, because the front projects over the cliff edge). It was to be only a 2-1/2 hour hike, so we didn’t need packs. It was amazing how much lighter my camera equipment seemed when it wasn’t in company with a backpack. We headed across the clearing and past the original house built by the family that settled Binna Burra, up around the campground, and past the lovely pittosporum tree, the fragrance of which delights me beyond words. We stopped at a sign that outlined today’s hike, and then we headed into the forest. Since this was a shorter walk, and not one of those gotta-keep-going-or-we’ll-never-get-back-by-dark marathons, James set a pace that was brisk but interrupted far more frequently. He pointed out buttress roots and strangler figs, stinging trees, forest apples, and rosellas crunching gum nuts overhead. We stopped to see the trapdoor spiders, and James pointed out a rock surrounded by cracked snail shells. This, he explained, was the work of the noisy pitta, a bird that smashes shells on rocks to open (and eat) the snails. We saw a hoop pine, one of the many popular timbers that became an early industry for the area (and which might have caused an early end to the rainforest, had not several people had the insight to protect this region). James also pointed out the Lignum Vitae, the tree with the hardest wood in the rainforest. Also known as ironwood, it’s so dense it sinks in water. It can be used for bearings and was a common material for parts of ships that would wear out if lesser woods were used. It has an oil that makes it insect resistant, and when it falls, it takes eons to decay. Cool. In the distance, we could hear a catbird calling. Its call was sort of a cross between a cat’s meowing and a baby’s cry. Then we walked on. As we walked, James told us a lot about the rainforest. Trees with buttress roots don’t have taproots. Everything in the understory has adapted to take maximum advantage of the limited sunlight: new growth is reddish, which processes sunlight more efficiently, and on some vines, the stems are as flat as the leaves, and are green as well, so more of the plant’s surface is exposed to the light.